The season finale of Scandal is here! Season five had a rocky start, and an even rockier middle, but the last few episodes saw us moving toward solid ground again. And in typical Shonda Rhimes fashion, she didn’t pull any punches in the finale, though her promised twisty ending was rather obvious. Let’s discuss! Last episode, we saw the presidential candidate field narrow considerably thanks to some behind the scenes maneuvering by our favorite campaign managers. Now, with only Mellie and Frankie left standing (on the Republican and Democratic sides, respectively), it’s time to choose a running mate. This means we get to see OPA deliver their patent rapid-fire rundowns on the candidates. As Olivia explains to Mellie, each of the potential running mates possess the three “M”s: male, married, and military. Great. Unfortunately, each of them also has some pretty deep secrets that are sure to come out and ruin Mellie’s chances at the White House. The only one that’s completely upfront with OPA about his sordid past is Bill Wagner, who readily admits that – though he would love the opportunity to be VP – he used to deal coke in college, and he does not want to tarnish her campaign. The fact that he was so honest is appealing, but he’s right — that will definitely sink a presidential bid. OPA decides to cover this little cocaine fiasco up for Wagner so he’s squeaky clean enough to be on Mellie’s ticket. They track down Wagner’s former coke dealing partner and bribe/threaten him into a new identity and a new home far, far away. Problem solved. While Liv’s team vets candidates for Mellie’s campaign, Cyrus is busy picking a candidate for Frankie. Cyrus pays a visit to David Rosen and asks him to be Frankie’s running mate. David is understandably skeptical. Cyrus doesn’t just hand out such power without expecting something in return. But Cyrus claims no ulterior motives. Unfortunately for Cyrus, upon returning to Frankie’s campaign headquarters, he discovers he has far bigger problems than a skeptical David. Sitting in Frankie’s office is none other than Papa Pope, who is offering a sizable contribution to Frankie’s campaign in exchange for Jake becoming the VP pick. Papa Pope sure is hell bent on Jake becoming VP. Papa Pope threatens to expose Cyrus for what he really is if he doesn’t convince Frankie to put Jake on the ticket. Poor Frankie is under the impression that Cyrus is good and noble and virtuous but we all know the truth, as does Papa Pope. Papa Pope also knows that Cyrus was behind the hostage situation and shooting that was directly responsible for making Frankie a household name. That’s the last thing Cyrus can allow to come out — not just because Frankie will never forgive him, but because it will ruin any chance Frankie has at the White House. But Papa Pope is underestimating Cyrus’ abject hatred of Jake. Jake is, we’re reminded, the man who murdered Cyrus’ first husband. Cyrus pays a visit to Liv and asks for her help. She says she can’t help him unless he’s honest with her about what her father has on him. With no other choice, Cyrus comes clean about setting up the assassination attempt on Frankie. Olivia is horrified and refuses to help, but Cyrus blackmails her with his knowledge of what she did to Andrew Nichols. This leaves Liv no choice but to help and means Cyrus can go back to pushing David Rosen as a VP pick for Frankie. The finale opened with Jake having a lovely chat with his new father-in-law. Well, it was a lovely chat right up until Jake poisoned him and said father-in-law keeled over dead. Now Jake’s bride, Vanessa Moss, stands to inherit half a billion dollars, which will of course help Papa Pope rebuild his war chest. It’s clear Jake’s heart isn’t in this particular killing, but he’s still a slave to Papa Pope and has to do what he says. Fortunately for Jake, Edison pays a visit to Olivia and delivers the message Jake gave him at the end of last episode, which basically boils down to “save me.” Olivia hesitates though, because she knows any attempt she makes to save Jake will result in his death at the hands of her father. But with Cyrus blackmailing her into solving his Papa Pope problem, Olivia decides her only option is to try to save Jake after all. Huck offers some advice: she can’t go about this with her usual behind-the-scenes fixer methods. That will never work. If she wants to save Jake, she’s going to have to just walk right up to Papa Pope and take Jake from him. After all, as Papa Pope says, the only way to take Command is to become Command. 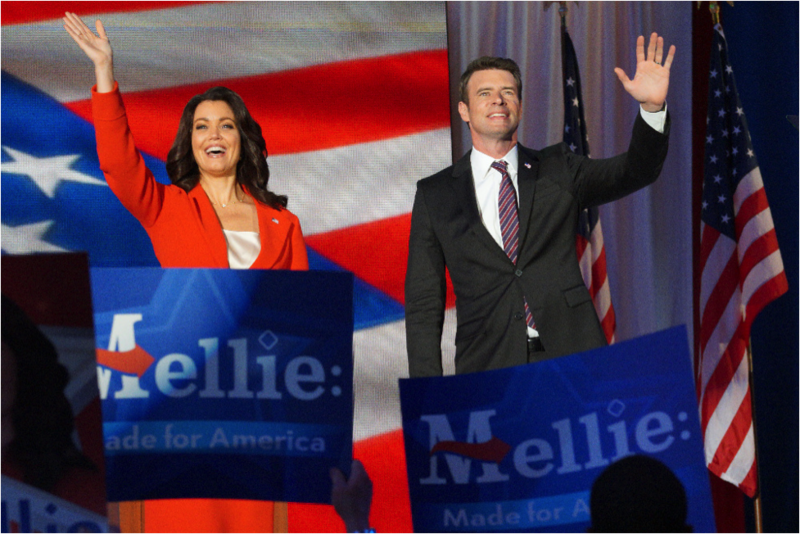 With this knowledge in mind, she decides that the only way to succeed is to declare Jake as Mellie’s running mate. Liv leaks the information about Wagner to the media, making him an impossible choice. Then she goes to get Fitz’s buy-in on Jake. Fitz agrees it’s a good choice and now Liv’s plan is really falling into place. The only thing left to do is tell her father she’s taking Jake. Olivia walks into her father’s home and tells Papa Pope and Jake what she’s done. When Mellie takes the stage in 20 minutes to deliver her speech at the Republican National Convention, she will declare Jake her running mate. Papa Pope’s response is to pull a gun and aim it at Jake’s head, declaring that he’ll shoot Jake. But after an intense game of chicken, Olivia calls his bluff. She knows Papa Pope considers Jake a son and he won’t kill him. Gambling with Jake’s life was a risky move but it paid off. Jake is free. Or is he? As he sits in the backroom at the convention, waiting for Mellie to declare him, he tells Liv he doesn’t want to be Mellie’s VP. Now that he’s free from her father, he wants to just run away. He wants to stand in the sun with Olivia again. He wants normal and boring. But Olivia refuses. She doesn’t want normal and boring. She wants to win the White House, and Jake has become a tool for her to do just that. Poor Jake. He traded serving her father for serving her. We all knew Fitz would have to find out about Olivia’s abortion at some point and the finale makes perfect sense for that reveal, though the execution was poorly contrived. Abby walks into her office and finds Fitz here, looking through the file Papa Pope gave her containing Liv’s confidential medical records. We have no idea why Fitz just happens to be in Abby’s office, how he found the file (last we saw, Abby was keeping it out of sight in her desk drawer), or why he felt the need to look through it at all when it just looks like a generic black file from the outside. And yet, despite all of these questions (which go unanswered), here he is, doing just that. So, okay. Now he knows. But how will he react? Without much fanfare, it turns out. He doesn’t even tell Olivia he knows. It’s true he had a come-to-Jesus moment earlier in the episode when Mellie berated him for being selfish and narcissistic and squandering a presidency he neither wanted nor earned. This has apparently caused some deep reflections on his part. So when he is presented with the opportunity to confront Olivia, he instead apologizes. For not listening to her enough, for being controlling and manipulative. Then he tells her that he supports her choice — not that she needed it. Liv assumes he’s talking about her choice to make Jake Mellie’s running mate, but we know he’s talking about something else entirely. Fitz is so rarely given moments of growth or reflection on this show, so when it does happen it’s nice, but also a little abrupt and not always well executed. I get that he’s come to the conclusion that it was her body and therefore her choice to abort their baby, but to not even have a discussion about it? To not at least tell her he knows? It just seems, well, like I said — abrupt. Throughout the episode, Tom has been gathering intel on where Cyrus’ husband and daughter are. Tom thinks he’s tracking them down so he can murder Michael for leaving Cyrus. But Cyrus has other plans. He reminds Tom that if they murder Michael, he’ll have no one to care for his daughter. Tom offers to serve as a “new Michael” for Cyrus, but Cyrus tells Tom that they’re both murdering monsters, and his daughter needs someone good and true to care for her. Tom still isn’t quite getting it, though. He thinks murdering Michael is clearly the solution. But then Cyrus delivers the bombshell he’s been holding back — he’s going to reconcile with Michael. They’re going to be a family again. Not only is Cyrus reconciling with his husband, but he’s also done with Tom, and tells him their affair is over. Ouch. I feel like there will be repercussions to this in season six. Tom isn’t exactly the most stable assassin or spurned lover out there. We’re left to wonder why Cyrus would ever behave like this — I mean, reconciling with his husband instead of having him murdered isn’t exactly standard Cyrus behavior. But we aren’t left guessing for long. Frankie Vargas takes the stage at the Democratic National Convention to declare Cyrus Beene his running mate. The way the whole episode built up to this made it clear this was supposed to be some epic twist for the finale that leaves viewers shocked and eagerly awaiting season six. But... wasn’t Cyrus the obvious choice all along? Doesn’t it make perfect sense that Cyrus would convince Frankie to put him on the ticket? Cyrus has always been completely upfront about his quest for power, and I spent the whole episode wondering why Cyrus wasn’t making a play for the VP spot himself. So when he did, it wasn’t the twisty-crazy finale ending Shonda promised. It was just common sense. Poor David Rosen though. He was just a red herring to keep Olivia and Mellie’s campaign in the dark about the true VP pick. The other “twist” was the closing scene with Papa Pope. We see him sitting in his home, lights off, glass of wine in hand, while he watches Jake declared Mellie’s VP pick on television. “That’s my girl,” he says smiling as the crowd cheers. 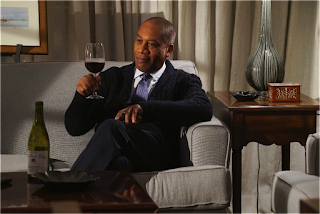 Again, I think we’re supposed to be shocked that Papa Pope is sitting there happy about what’s transpired, and again, this seems like common sense. Papa Pope has done nothing but push his daughter to be power-hungry and manipulative and she’s become just that. He wanted nothing more than for Jake to become the VP nominee, and now he’s become just that. 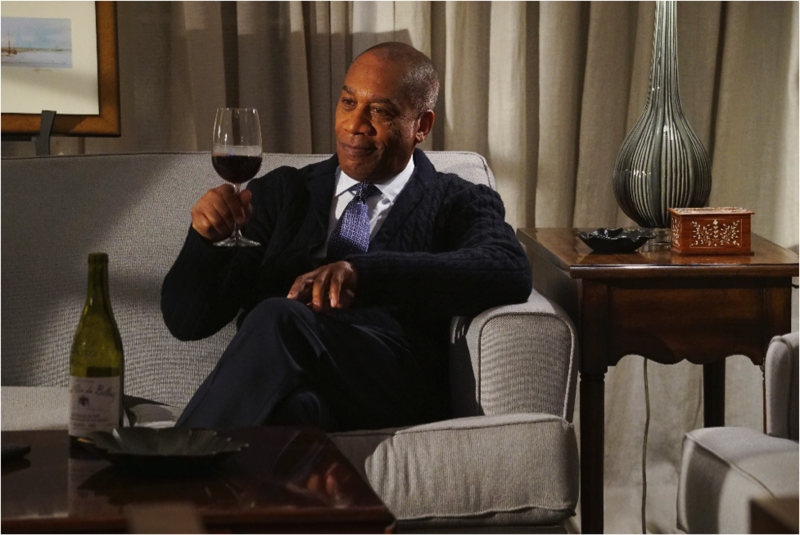 Papa Pope has gotten everything he’s ever wanted — and he’s done it in the best way possible — by making everyone think they’ve escaped his evil clutches, when they’ve really just walked right into his trap. Even if the finale twists were far from epic, the Mellie-Frankie showdown we’ll see in season six will be, as will the Olivia-Cyrus showdown, and whatever shenanigans Papa Pope has in store. It’ll be a long summer while we wait, but hopefully it’ll be worth it.